“One for the road” is a widely used toast around the English-speaking world. The origin of this expression is linked to the London tradition of offering a drink to those sentenced to death during the journey of the approximately three miles which separated them from Tyburn Tree and the gallows. At that time, the executions were festive occasions, and it is estimated that between 1196 and 1783 40,000 to 60,000 sentences were carried out. “One for the road”, a common dedication of the last drink of the evening to the road, here becomes the pretext to tell the story – in 19 rounds and of course, a toast – of a character without a face and his long last night, spent at the counter of a bar revealing himself to an unnamed party. These are the elements. Everything else moves in a no mans land between dreams and reality, against the backdrop of a cruel hunt, where the tracks of the hunter mingle and overlap with those of the prey. Preface by Jack Hirschman. Translated by Peter Storrey. Illustrations: 12 plates by Enzo Santambrogio. “One for the Road” is the chronicle of one crazy night, one night that came at least once in everybody’s life, with an ending that couldn’t be different from the chosen one, all to be read. Or, better, drunk. And possibly gulped down. Baraldi is one of those poets of prosody who has been cut loose from the moorings of traditional European writing by a keen and even obsessional awareness of American popular culture. Comic-strip culture, especially. In closet drama the actors perform their lines as if no one else were on stage. They perform, that is, for the love of the language itself and only incidentally for actions to take place. All ‘relationships’ in the drama are resolved in the isolation of the dramatic — hopefully poetic — sayings of each of the actors because, rather than aiming their words at each other to further an action, the actors demand a ‘leap’ on the part of the audience, which must in effect invent the actions that the words only imply. One soon realizes that one is experiencing a monologue from which the play has been shaped, that the intentional isolation of the characters is part of its message of alienation. 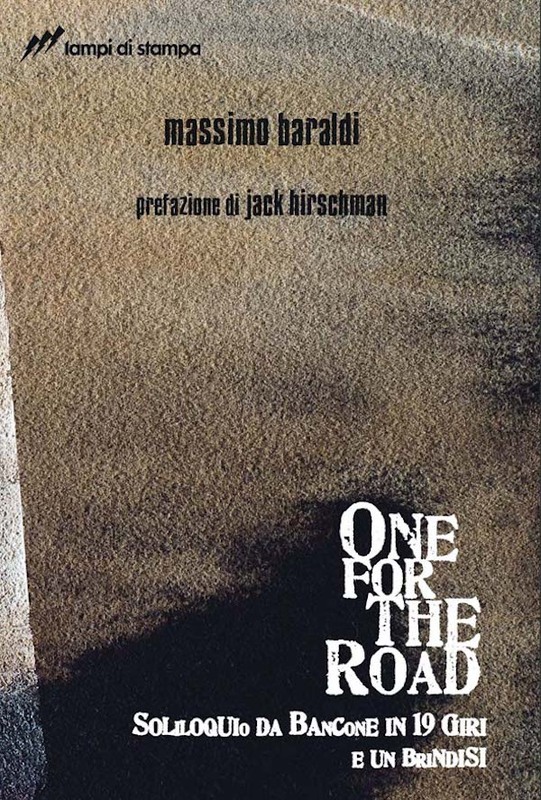 Massimo Baraldi’s One For The Road is a monologue in l9 ‘Rounds’ or ‘Turns’. I prefer the former because a Round in American is both a reference to the English song sung by a number of voices, and to the drinks one buys for people at a table or at the Bar, i.e (to the Bartender): «Let’s have a round of beer (or wine).» Obviously the title of Baraldi’s work is meant to evoke a last drink before one leaves a scene, but with this writer—who uses a wide range of tragicomic strategies in this work — there is an irony from the get-go. ‘One for the road’ is a popular expression for a last drink. But One as a person for the road is also an expression of the very process of this extended experiment in monologue, which winds and turns and gallops across a landscape inventing the shapes and figures that populate the terrains of his sensibility without ever being certain that they or for that matter himself really exists. And what terrains! Baraldi is one of those poets of prosody who has been cut loose from the moorings of traditional European writing by a keen and even obsessional awareness of American popular culture. Comic-strip culture, especially. Those Rounds or Turns in the title could very well also be Frames — and all of the 19 parts of this work the illustrative strokes of the pen of one gigantic comic-strip of the mind in a time of lunacy that extends the question regarding what is or is not There (existing). 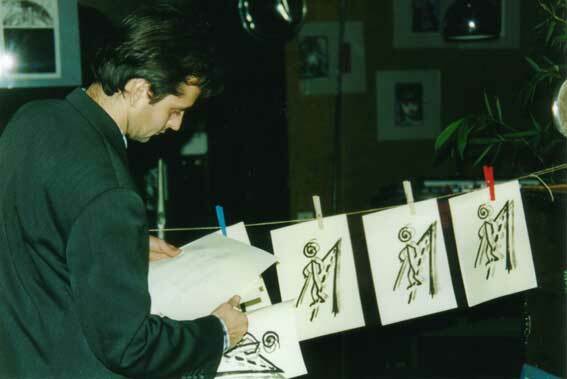 Baraldi gives the names of comicbook characters new life in his work. The dreamgirl is Silver (the name of the Lone Ranger’s horse), and there’s J. Wellington Wimpy of Popeye fame, and even a wild and wacky language concocted from the dialect of Modena, the area where he grew up. All of this is part of a canvas where human loneliness is realized as a supercharged inventor of those grand existential questions, like: I’ve been traveling so long, why haven’t I moved? Or: Do all these creatures and things I have named really exist, or am I really a butterfly dreaming that they do? But Baraldi’s arsenal contains the weapons for at least some answers to the problems human alienation forces upon our selves. He is brilliant with the tactic of self-conscious narration. This effect — which in the English world goes back to Elizabethan times and is most elegantly practiced by Lawrence Sterne in Tristram Shandy, and as late as James Joyce in Finnegans Wake — is one in which, in the midst of the most profound observation, an author will shift a gear by referencing the very work he is creating and, by such resultant comic relief, create a double effect of depth and levity. Though a relatively young writer, Massimo Baraldi already has the wherewithal to take on the tragicomic possibilities inherent in the genre known as monologue. And in world and time and moment such as we all are living through these days, what with what by now is old-fashioned subjectivism having been atomized by The Bomb, smithereened by identity with the things we consume, and ‘framed’ in both the political and technological sense, so that our ground is groundlessness and our souls an abyss, we need such new, generational and generating voices that can dare the void and hopefully show us, as Baraldi does, how to fall upward. 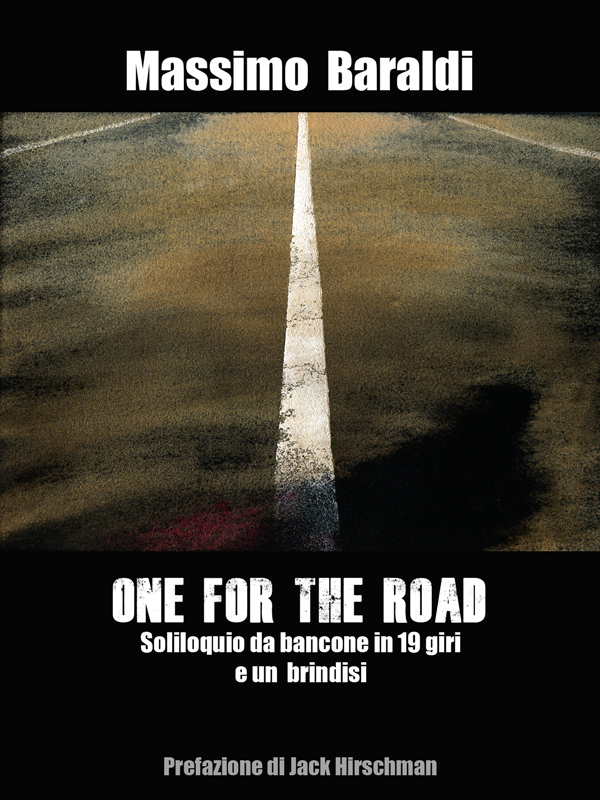 The very first release of “One for the Road” was produced in 2002 with the sculptor Enzo Santambrogio in a special limited edition of 100 copies. 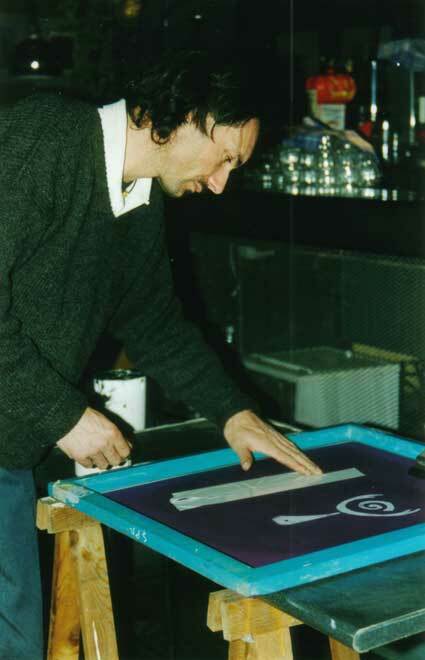 The book is iron bounded and contains 12 original silk screen printings, all painted individually with liquors and wine. 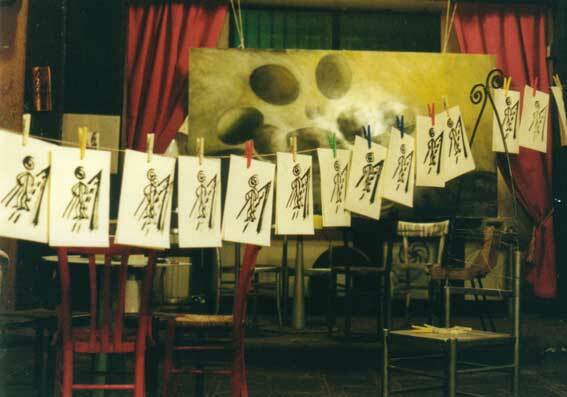 The book was exposed at “LIBRI MAI MAI VISTI 2002” (Russi, Ravenna). The Exhibition was prepared by the Cultural Association VACA and the Municipality of Russi with the collaboration of the Museum of Illustration of Ferrara and was supported by the Province Emilia Romagna and the District of Ravenna. 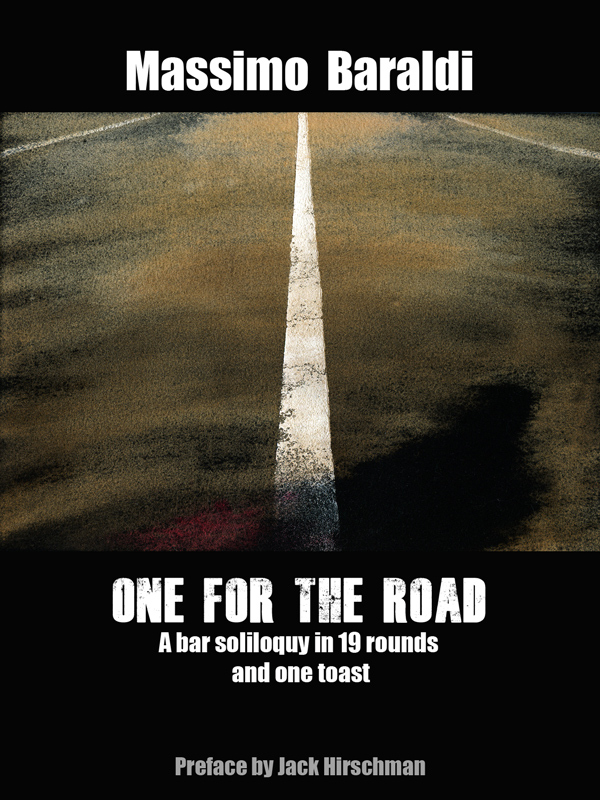 A few side projects are connected to “One for the road” and amongst them there is a theatrical work in 10 rounds (and one toast). I have a demo for that. You can view it here.